The weekend came and went in a jiffy for me, but that’s always been the case, particularly since I took up freediving. I would usually be able to sneak in a day nap or two during my Saturdays and Sundays in between news reading (my 2nd job), but this time I didn’t have the luxury as I wanted to fit in a pool session with Stefano. We settled for mid-day at the Indoor Stadium Pool on Saturday. Open ocean wasn’t gonna happen as the Poni boat was only going off to Pelong which isn’t ideal for training (only fun dives as it’s about 8m in depth). I couldn’t join any crew on Sunday as I had 2 news shifts to attend to. It was a tough session at the pool. Both of us seemed to be frustrated with my seeming lack of progress but halfway through it I reminded myself to be patient. We checked on my static apnea, duck diving and attempted some dynamic apnea (finning) – all the technical stuff in the deep pool. Now when you have a one-on-one session with a world class competition diver and are working within confined parameters, small mistakes or bad habits get amplified or you have to rethink how you do things. That was pretty much the case for me. Imagine being asked “show me how you breathe?” or “tell me how you turn around in the pool?”. How do you answer that? I mean, I breathe just fine thank you. And turn in the pool? You just turn, no? Even from a freediving perspective, that had me stumped. So I just humbled myself and was open to being retaught. And remember how I was told I was good at my duck dives? Yep, that came into question as well so there went my confidence. For my static apnea on full breath (holding your breath with as much air in your lungs face down in the water), I was shocked to hear that I reached 2 minutes 45 seconds. Not shocked because of the how long I was able to hold it in compared to my first time in Bali (2 minutes 8 seconds), but because I know it wasn’t my best ‘performance’ and yet I still managed to go longer. Time had definitely become arbitrary for me. I wasn’t relaxed, being nervous and all, and I couldn’t achieve the “zen” that I did in my first pool session before. So that really said to me that I probably could hold longer if I was in a better meditative state and also that my CO2 tolerance level has gone up. I guess that’s why Stefano seemed frustrated with me as he has seen beginners do up to 4 minutes in breath holding. But again, I had a self-talk to be patient with myself. The duck dive technique I was taught by my instructors were smooth and graceful – mainly bending at the hips and streamlining in. Stefano came in with insight on how to make it more powerful, thrusting the fins with legs from a bent position so that by the time you’re in the water, a great distance has been covered. It was almost new to me as it had me trying to digest the additional steps to start a duck dive and even what happens once in the water! Dear lord, the focus was all about my hands after that (not break the water too early). I almost wanted to just throw in the towel and walk away but I calmed down and made the conscientious decision to enjoy being in the water and have fun – which is what I joined freediving for in the first place. The tide later turned as Stefano was tired from his earlier swim laps and he was empathetic to the fact that it was a lot to take in for one session. So we stopped for the day when the sun was beating down hard in the noon sky. As with everything, it takes practice, practice, practice and the muscle memory needs to kick in. 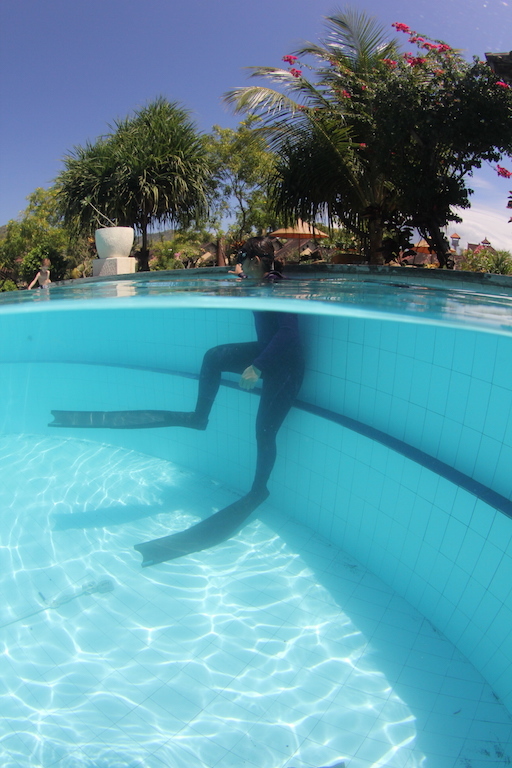 Photo taken by my first instructor, Nicholas Kouvaras, at Fusion Freediving in Amed, Bali when doing the skills part in the pool (first part of Pure Apnea certification course). There may be a bit of a setback for completion of my AIDA 2 star certification — something beyond my control– so I’m also having to adjust mentally and emotionally. It’s fine. I’ve gone into broken record mode reminding myself why I’m doing this. It could be that next Sunday I will be completing the final few aspects of the AIDA 2 star training, or fun diving with my original crew — #ceklidivecrew. Like the ebb and flow of water, I’ll just go with whatever.